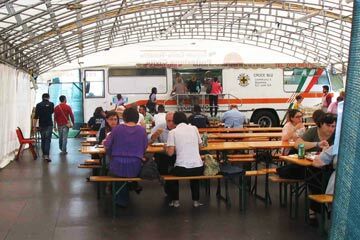 Two volunteers from Taizé were in Mantova during May 2012. A few weeks later the region was struck by several earthquakes. Frederik (The Netherlands) and Davide (Italy) went back to visit the inhabitants of the Mantova region again in September. They were there to take part in a national meeting with two brothers of the community and young people who had come from various regions of Italy, and at the same time to spend several days with those who had lost so much during the earthquake. Being sent to Mantova, in Italy, gave me the opportunity to see once again the great importance of these meetings: to give people the opportunity to meet and to offer hospitality. There is a great will in people to be together and to meet but they simply do not have the opportunity. After the meeting we went to visit the areas struck by the earthquakes. 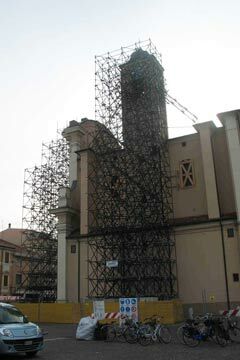 I visited the small town of Mirandola, were the entire town centre is held up by scaffolding and there are fences everywhere. But the centre itself is deserted as if it was a ghost town. And it is, nobody lives there anymore, everybody relies on friends or families for their stay or they stay in big tent camps, hoping that they will get something that can be heated for the winter. Almost all of the churches in the region have been destroyed, many of them have no roof and the furniture has been removed to be stored in tents or sports halls. Inside, the churches are very dangerous and often inhabited by birds and other animals. But at the same time I saw that the life of the churches is very active. We visited a parish which is meeting in a sports hall, and an astonishing amount of people came together there on Sunday evening to pray vespers and then to eat together. And this is a result of the earthquake as well. People suddenly rely on each other and need a place to be together. The churches don’t give up because of a small disaster. They always continue to welcome people and to continue to live. Everywhere you see signs of compassion among people. We went to visit the town of Moglia. We were accompanied by Raffaele, a young man involved in organising the meeting in Mantova and very committed in his parish. Moglia is the most heavily affected town in the province. The historic centre is still closed off, even now, the church and the town hall are unusable, in ruins, many homes destroyed, roads and shops closed. Everything has been moved into metal containers installed on the square in front of the cemetery. You could say that that square has been the town centre. We made a tour of the streets with Raffaele. He told us what he remembered about the earthquake and how he lived in a tent through the summer, like many other people. It was only two weeks since the town council had finally ordered the closure of the tent village before the arrival of winter. From the outside the houses do not seem to have suffered damage, but in reality they are completely destroyed inside and it is no longer possible to live in them without a huge amount of rebuilding work. On Monday evening we met the parish priest of Moglia and a wonderful group of young people. At the moment the community of Moglia is praying in the school gym which, luckily, suffered no damage. The altar is in the goal! I very much enjoyed being with these young people. The prayer time we shared was deep and beautiful. 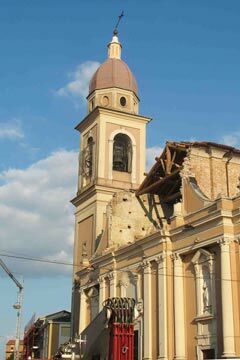 In Finale Emilia, we find many destroyed buildings: particularly the castle and the clock tower have been badly damaged. There are whole streets barred still with bricks lying on the floor. There are however many positive signs: the parish primary school has been rebuilt and a big temporary building serves as a church. On the little playground of the youth club young people play football, I like to know that they are happy in their town. On Tuesday afternoon we left for Poggio Rusco. Don Tonino was straight away enthusiastic to welcome us because, he said, since the earthquake he hadn’t been able to organise a single time of prayer to bring together all the parishes from his pastoral unit. The six churches are damaged: he always says mass under the trees because the big tents meant to shelter the congregation are not ready yet. In the evening we organised a time of prayer. Don Tonino was happy to have a prayer with the songs of Taizé in his parish.